Savage Wizdom are a heavy metal band from Santa Fe, New Mexico, USA. "A New Beginning" was released in 1984 on Metal Blade Records and is a heavy metal classic! Wait? No it wasn't. It was released in 2014 and is an independent release, but it sure does sound like those good old days of epic, proud, heavy metal. Savage Wizdom has a sound not unlike Omen, early Fates Warning, early Helstar and those glorious, epic metal bands of old. Galloping riffs, dual guitar solos, a pounding rhythm section, soaring, clean vocals and memorable songwriting. Don't let the lengthy songs deceive you either, these songs are not long, drawn out and boring. 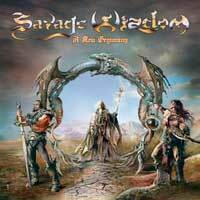 This is "savage" heavy metal and with the possibly exception of the short intro track, never a dull moment is found. The album was produced by Augustine Ortize (ex-Ultimatum). There is even a guest appearance on this album by vocalist Blaze Bailey (ex-Iron Maiden, Blaze). Savage Wizdom has it all.